Image 1. Folded cards shown on mouse over. Being able to see what cards you’ve folded is a great feature in many poker clients today and it is interesting to see how the function has been implemented differently. 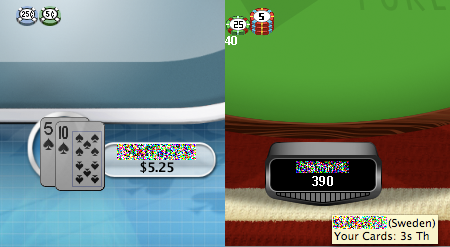 In the image above you see how PokerStars (left) and Full Tilt Poker‘s (right) versions. PokerStars implementation works better because the player see the cards right away and doesn’t have to think about what “3s” and “Th” means. User experience needs to play a key role when adding new features (no matter how small they are) to your gaming product’s user interface. It will be the thing differentiating your gaming software from your competition.